Chasing The Cyclone by Peter Thomas Senese has been hailed by book critics and child abduction prevention advocates as a well-written, page-turning thriller evolving around a plot of international child abduction and as a blue print on how targeted parents of abduction can educate themselves on the many warning signs and risks of abduction. Chasing The Cyclone is now available at all major online e-book retailers including Barnes & Noble and Amazon. 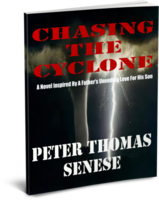 Peter Thomas Senese's new novel Chasing The Cyclone has been hailed by book critics and child abduction prevention advocates as a road map on how a parent may either prevent the international abduction of their child or reunite with their child. Senese's novel takes the reader into the odyssey of a parent's attempt to prevent a child's international abduction, only to have the courts fail to initially recognize the intent of the abducting parent. Chasing The Cyclone is now available at all major e-book retailers including Amazon and Barnes & Noble in English. Spanish, Italian, and French e-book versions of Chasing The Cyclone will be released in May, 2012. In addition, best-selling geopolitical thriller author Peter Thomas Senese is pleased to announce the critically acclaimed international legal thriller Chasing The Cyclone is now available at Barnes & Noble in e-book for Nook readers. Previously, Chasing The Cyclone was made available exclusively on Amazon as Mr. Senese donated 100% of his royalties to the I CARE Foundation, an organization created to assist parents and children targeted for abduction.